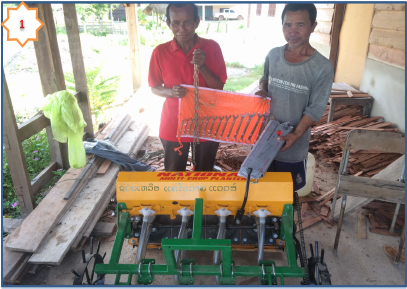 This is another update from Leigh Vial on our Laos Seeder project, since he reported in April on his visit for the rollout of the machinery. At the end of May, Phetsamone, Souliphone and Ms Khetsana, staff members from the Provincial Agriculture and Forestry Office (PAFO) in Savanakhet in Laos, went back to the villages that had received the seeders and visited the recipients of the seeders. They also applied the name stickers of the donor to each seeder; supplied the farmers with a spanner set, grease gun and lifting chain that accompany the seeder; inspected the fields that have been seeded so far and discussed successes and problems with the farmers. They told me that the rains were unusually early and only a little seeding got done before many fields got too wet. As a result, the farmers commenced transplanting into the early-flooded fields. The rains are easing now, so seeding is recommencing on higher fields. They are happy with the performance of the seeders, but have had some problem with seed placed too deep in soft, freshly-tilled sandy soil. Some have already started to adapt the seeders by lifting the tynes a little to place seed shallower. The pictures of fields I have seen so far look promising. Weed free and fairly uniform, with an appropriate density of seedlings. The farmers expressed a desire for sparsely-spaced seedlings, to mimic the density when transplanting. I do not have more details than that at this stage, but please enjoy some of the photos of recipients with their seeders. The photos only contain a subset of the recipients, as it was hard to get everyone there at once. Yes, the stated recipients are all male, but rest assured there are very pleased female family members nearby! The next month or two will produce some interesting stories, I am sure. I am pleased that we seem to have the right machines and arrangements to create those interesting stories. Seeing the machines with donor names affixed highlights a special feature of our program. The generous donors are responsible for placing these superior seeders in the hands of experienced, creative farmers. No strings attached. They really do appreciate that gesture, and aim to explore what these seeders can do for their farms and livelihoods. I hope you will enjoy the tales that come from it. You can read more about the rice seeder rollout on ABC’s Rural news online: Rice seeders may start technological revolution in Laos agriculture as workforce moves out of farming. And at our earlier stories here, here and here for where it all started.